Moonologie: IT WILL BE THERE - SPRING AT HOME. IT WILL BE THERE - SPRING AT HOME. there is a family of crows, doves, bluejays and hummingbirds that seem to have made their home in many of our trees, especially the tall redwoods and the one giant sycamore whose roots are uplifting our grass. each day, usually around eleven and then again at around four, we go out and call to them. "birdies, hey birdies," we say, as we throw bits of bread and peanuts for the big guys, and more homemade nectar for our hummingbirds. gus lives for this, almost as much as i do. 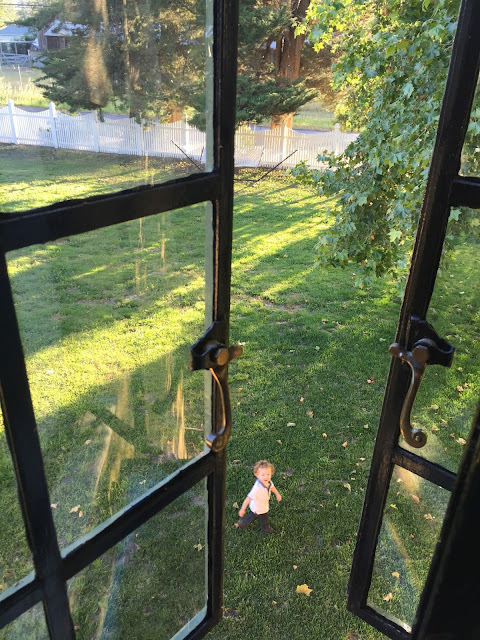 i usually grab a small blanket and move to a small patch of grass that is outside our kitchen window and i will sit and wait for them, watching them slide in the sky, watching gus chase after them, though they appear miles above his tiny body. i'll bring snacks and drinks and position myself where i can see it all. while waiting, i will usually hang our clothes to dry on the clothesline, something i have grown to love. it settles my soul in a way that picking up a guitar must feel like to a guitarist. it's simple and good and true. it's everything that i love to be: a mother and a wife, taking care of my people, my family, in every way i can. being outside with the sun, opening the wooden clips and closing them onto our wet, freshly laundered clothes. it's not so much that i love to clean, because i don't, but it means that i get another day to care for the loves of my life. another day to love them out loud. i love hanging gussies little onesies and leggings. i love hanging my husband's collared shirts and my light cotton dresses. i love looking up and seeing the hummingbirds an arm's reach away, while gus is talking to his piles of sand and tow trucks and my cat is brushing up against my bare ankles. i told my husband just this morning while we were outside, that this will probably be the place i need to go to when i am in the depths of labor. with augustus, my husband spoke to me a scene that we both loved, one that was peaceful and beautiful and vivid and lived. it was in our old backyard, near our pond which had a giant jasmine bush that acted like a backdrop in some cheesy french movie. he would go through each inch of that memory, explaining each flower that he could remember, what it felt like to have the sun beating our face. this time, it will be different, but only slightly. it will be in our new backyard. alongside our birds. right next to my clothesline which is above the strawberry patch and nasturtium. a glance away from my milky skinned baby boy with dark blonde curls and an overbite that brings me to my knees. it will be there, where my husband drinks his cabernet while he grills the asparagus and fixes the swing and talks about grand ideas that i've never considered. yes, it will be here. Oh, I so look foward to your photos and words! They are a breath of a fresh air and you are a radiant light and encouragement! :) Thank you for sharing your simple days. that was such a beautiful read, kerrie. and i imagined all of it. so delicate, so simple and so calming. those words were so calming to whisper line by line. as i sit here and sipping my coffee, i could only remissness the joys of dwelling in your serinity yard together, softly laughing and smiling at all the wonderful simplicity life has to offer us. one sweet day, my friend. ps..i need to find a way to keep up to date with your posts...u should get bloglovin...i always check it to see updated blogs that i love to follow..and yours are def one of them.